When Shekhar Grover won the title of Best Cruise Line Bartender in the Diego Reserve World Class competition, he was tested on different aspects of his craft, creativity and bartending knowledge. Shekhar excelled in the bar arena and wowed judges with his signature serve inspired by this year's Mediterranean theme. Then add CIROC Vodka and dessert wine. Add a splash of Creme de Cassis and cubed ice. 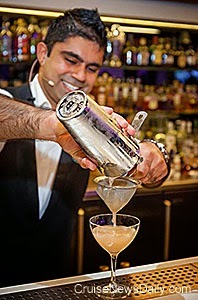 Shekhar Grover is a Lead Bartender aboard Royal Caribbean's Oasis of the Seas. In case you haven’t checked your calendar (we know you have it marked), exactly 150 days from today, on November 7, Costa Diadema will be christened in Genoa, the company’s headquarters and home to much maritime history. The christening event itself will actually come amidst a month-long celebration of the new ship. Earlier we told you about four cruise line bartenders competing in the finals to be named the Best Cruise Line Bartender in the Diego Reserve World Class competition which started with 5,500 cruise line bartenders competing in the first round. CND subscribers also read about a first birthday in northern Europe ... and we're wondering if a buyer was found. CLIA released some astounding figures today, and if you’re in North America, you can no longer say you are in the number one cruise market in the world. 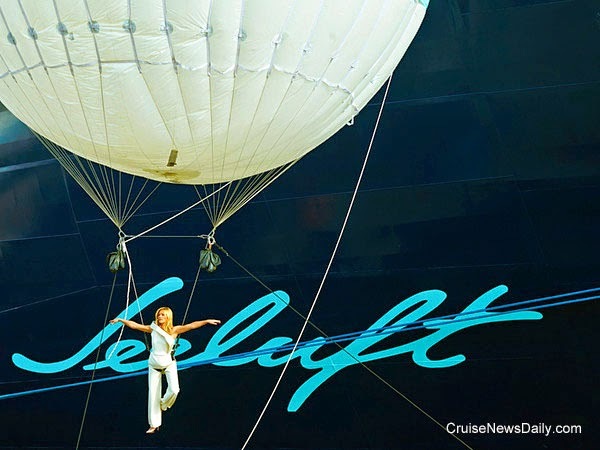 TUI's Mein Schiff 3 was christened in Hamburg this afternoon, and its godmother, singer Helen Fischer, made a rather unique entrance to the ceremony - probably one of the most unusual in cruise industry history - when she arrived hanging from a balloon. MIAMI, FL – June 12, 2014 – Celebrity Cruises has promoted a trio of its top people from the North American sales team led by Dondra Ritzenthaler, Senior Vice President, Sales, Trade Support and Service. Keith Lane has been promoted to Vice President, Field Sales and National Accounts, North America; Carol Cabezas to Associate Vice President, National Accounts and Strategic Accounts, North America; and Ron Gulaskey to Global Director, Corporate, Incentives and Charter Sales. Previously Celebrity’s VP, Field Sales, Keith managed Inside Sales, Training and Development, Sales Communication and drove the market intensification strategy in North America. In addition to managing these areas, Keith will now lead the premium brand’s Field, National Accounts, Strategic Accounts, and Sales Support teams. Keith will be responsible for all sales efforts and the development and implementation of account promotions and advertising initiatives. He joined the company in 2004, and during his ten years with the brand Keith has been responsible for widely successful launches of new sales teams in key markets, and was part of the 2008 executive team that created and introduced the then new boutique cruise line, Azamara Cruises, now Azamara Club Cruises. Carol Cabezas, former Director, Sales Planning and Strategy, will report to Keith Lane in her new role as AVP, National and Strategic Accounts, North America. She will manage the development of business opportunities with national consortia, key strategic trade partners and the continued success of Celebrity’s Galapagos product. In her previous role, Carol was responsible for a wide array of operations, including the development and implementation of national promotional campaigns, trade compensation, business analysis and strategy, financial planning, and automation tools for trade and field sales. She also was part of the team that developed and implemented Celebrity’s 123go! and Pick Your Perk - two of the most popular and applauded promotions in the cruise industry. Formerly the Director of Corporate, Incentives and Charter Sales, Ron Gulaskey will now lead the team as Global Director, reporting to Dondra Ritzenthaler. Ron joined Royal Caribbean International in 2002 as Sales Director, North East Region, and was promoted to Director of Corporate and Charter Sales, Celebrity Cruises in 2005. Ron has successfully built and grown Celebrity’s corporate, charter and strategic partner business, and in his new role as Global Director, he will continue to drive growth and profitability worldwide. With these new appointments, Celebrity Cruises continues its strong tradition of supporting the travel agent community. * Are You Missing Something? Cruise lines tend to make a big splashy announcement when they have a ship going somewhere new, but when they stop operating from a port, the way the community generally finds out is by realizing their city isn’t mentioned in the current schedule. Of course the port has been notified, but they generally don’t want to make a big announcement about bad news that involves them. That’s what’s happened in New Orleans. Royal Caribbean has quietly withdrawn their seasonal program from the market after this coming winter’s, and the local news media has just noticed it. A 33-year-old woman aboard Carnival Valor reported a sexual assault last Friday while the ship was docked at St. Kitts. CND subscribers also read about the only thing missing is some really gory violence ... and the gates have arrived. transit via STX Sun Rise. Photos courtesy of Panama Canal. All rights reserved. May not be copied or used without permission. Royal Caribbean gets some credit in this story for going with the flow and using resources at hand to come up with something new (at least for them, and in this market) that’s going to please their customers. Radiance of the Seas is one of the line’s two ships in Alaska this summer, and aboard is Rita Cantina, which was just constructed during the ship’s recent revitalization. Royal Caribbean knows that their passengers aboard Radiance are going to Alaska to eat whales, chase moose and see seafood - or some combination thereof. Will they be as interested in having a taco and sipping a margarita in Rita’s Cantina as they will be excited about having crab legs or fresh salmon in an Alaskan restaurant? That's why Rita's Cantina got a major overhaul - but just for the summer season in Alaska. CND subscribers also read about a superfan in Germany ... and whales at play. 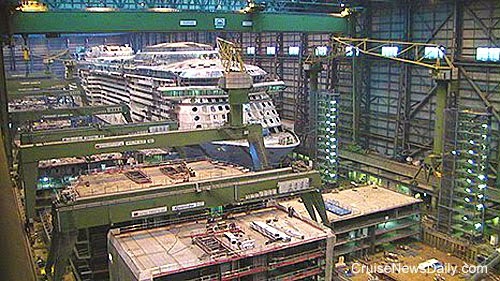 Quantum of the Seas under construction as seen today at Meyer Werft. Over the years, the job of the Cruise Director has evolved aboard ships. At one time the cruise director was seen more or less as a dashing and debonaire fellow although possibly a little unseemly as he ran the show aboard ship for the passengers and schmoozed them. 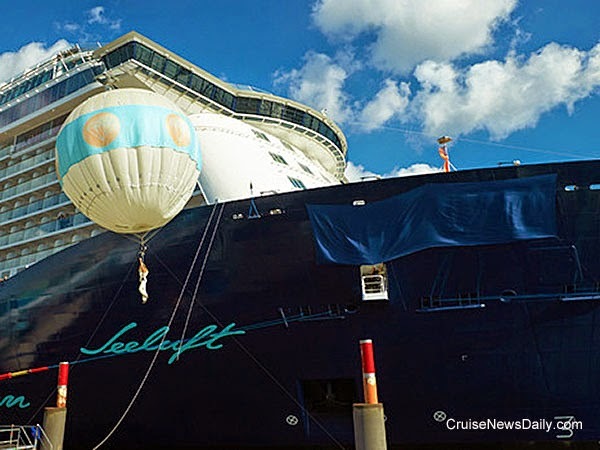 But that’s evolved over the years as cruise lines have become huge corporate businesses, and now he (or she) has taken on the role more of a professional heading up a department that is responsible for entertaining the passengers, but the cruise director is still the person who is the “face” of the cruise line to passengers. And now, Carnival has created the position of Entertainment Director. Celebrity Cruises is marking their tenth anniversary in the Galapagos with several programs that will connect the cruise line and passengers more closely with the local people of the remote islands. The cruise line is continuing its commitment to support the communities of the Galapagos with a medical clinic, fishing and agriculture cooperatives and a partnership with the Galapagos Conservancy, which includes a matching program to double the value of passengers’ donations.